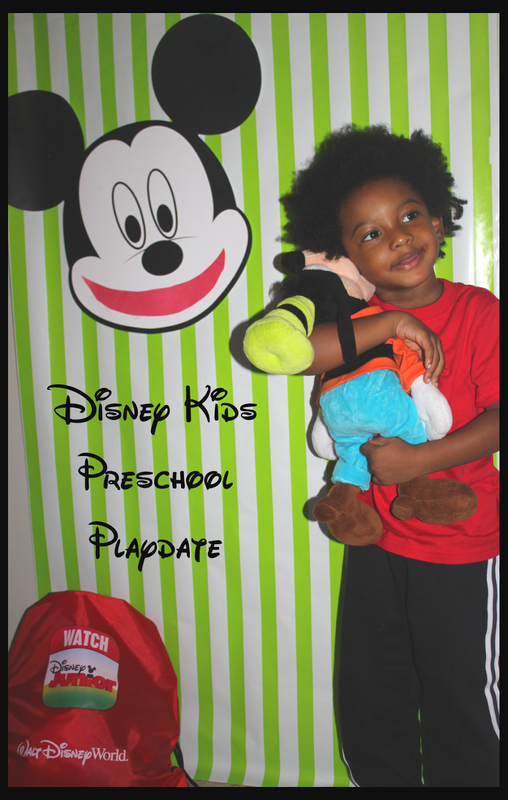 Disclosure: I received free products in order to host the Disney Kids Preschool Playdate. The opinions expressed here are my own. Pixie dust is probably the only thing that can be sprinkled around the house that does not require a vacuum to clean up the mess. In fact, it is a welcomed guest. It brings the most magical experiences whenever it lands in your life. Somehow, smiles are sizable, moods are merrier and laughs are louder in its presence. And the magic of pixie dust is noticeably present on any occasion that involves children. 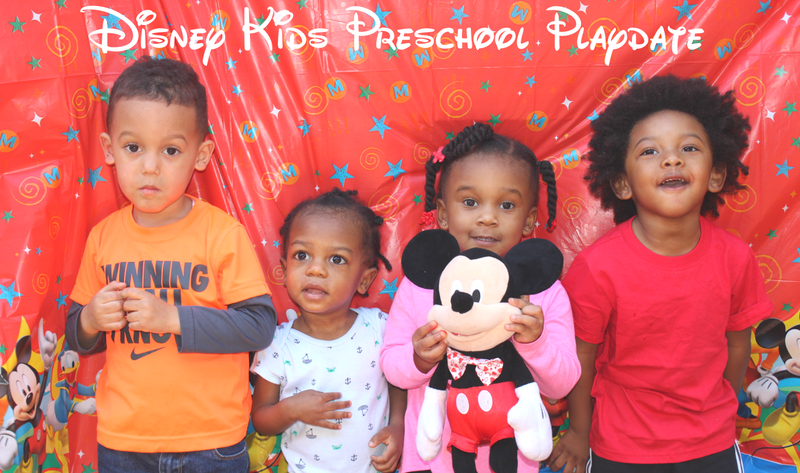 Our Disney Kids Preschool Playdate was graced with the magic of Disney World and helped carve out a moment in the day to celebrate the beauty of play. As the mother of a toddler, I know that my son requires a lot to hold his attention. He is easily distracted by the tiniest of moments and needs to be entertained to a certain degree to maintain a level of happiness. What this all means is – he needs to have fun with a lot of stuff! When Disney sent us over a generous package of their goods, I was thrilled to dig in and explore the magic. It felt like Christmas in March as I unboxed all of the goodies and laid them out on the floor to get a better look. 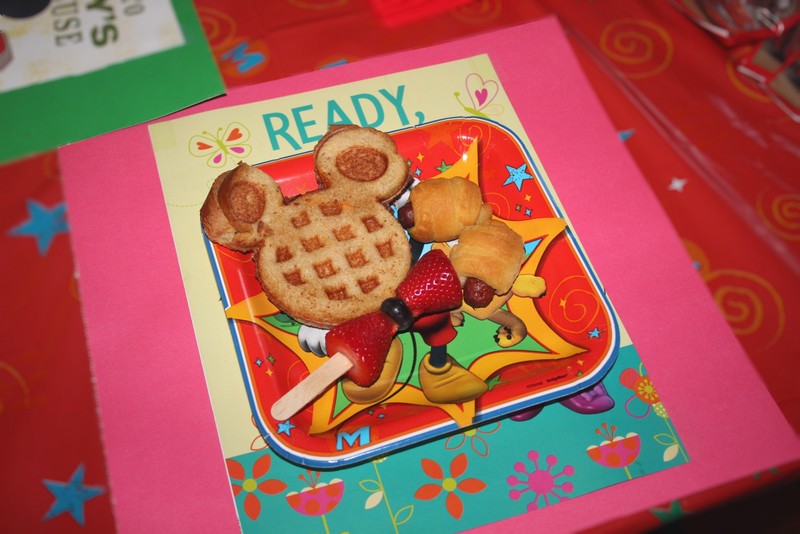 Disney sure does know how to cover all the details and make hosting a playdate a breeze, especially for busy families with tight schedules. 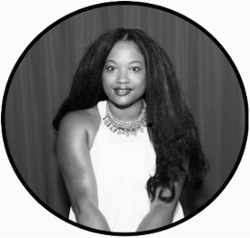 March was extremely "mad" and finding the perfect moment to host this event was difficult. So, I made sure to get it in before all the Easter fun so that the children would not be overwhelmed. 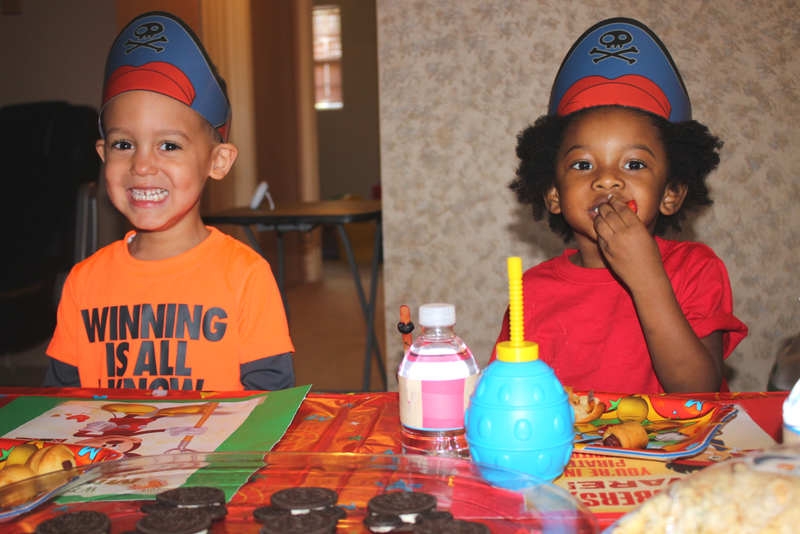 I made our playdate as simple as possible – food and fun. I've learned that toddlers are never really concerned with details; they like to see the bigger picture. A lot of the stress of party-planning is self-imposed. Do what you can and have fun. 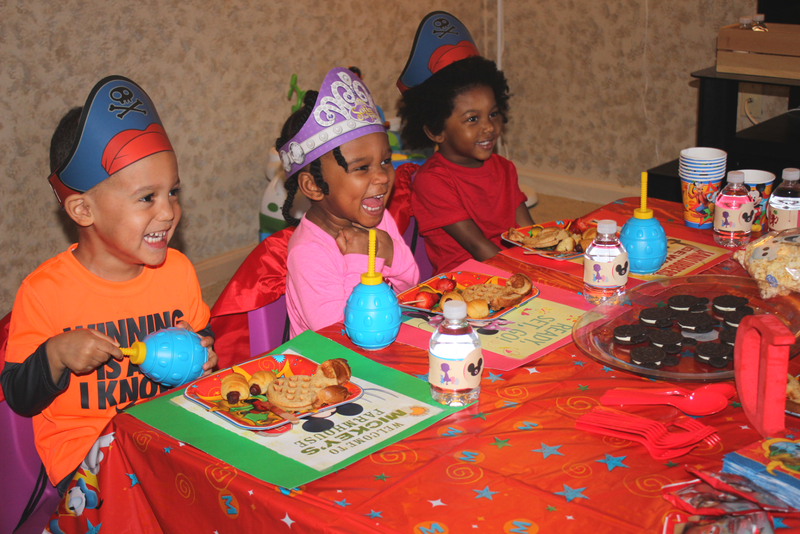 I managed to incorporate a few Disney-themed inspirations to help the playdate feel special to the children. At the end of the day, your guests (even the tiniest of ones) will appreciate your efforts. 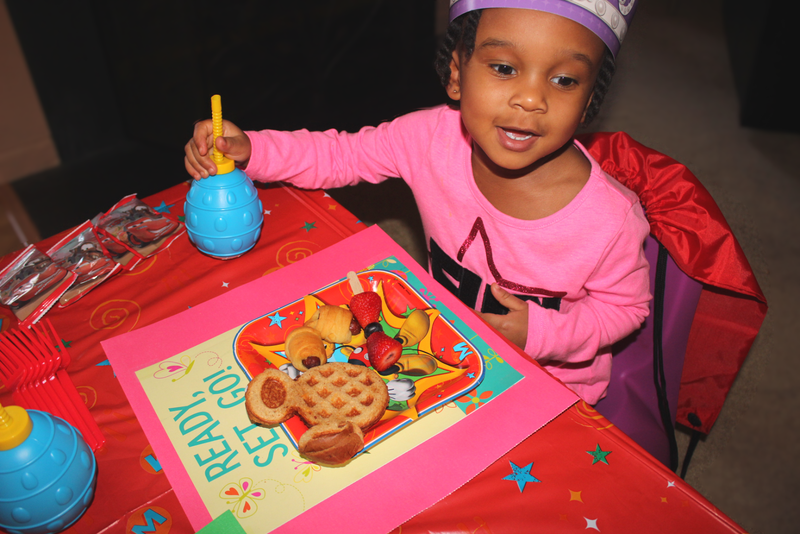 Finger foods are perfect for the little ones. I thought of the classics that most preschoolers enjoy. 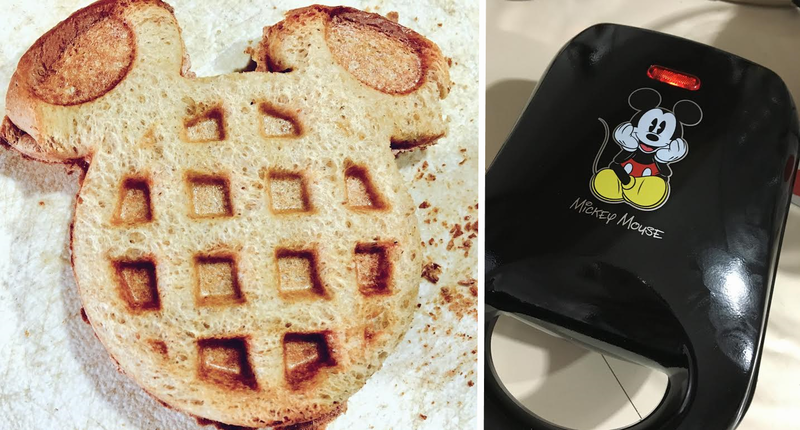 Using a Mickey Mouse waffle iron (a birthday gift from my cousin), I made the perfect grilled cheese sandwiches. They were quick to prepare, easy to hold in tiny hands and darn cute. 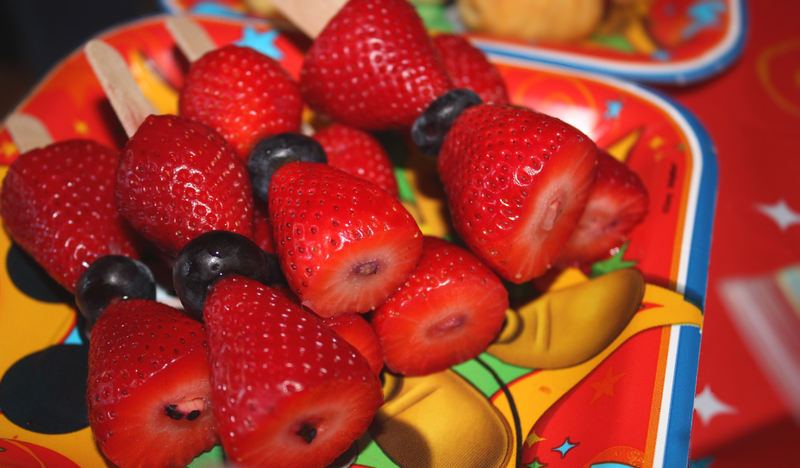 To add a more nutritional element to their meal, I mimicked Minnie Mouse's hair bow (or Mickey Mouse's bowtie) by placing two strawberries with a blueberry center on a popsicle stick. I also made miniature "pig in a blanket" bites using crescent rolls to wrap around cocktail wieners. 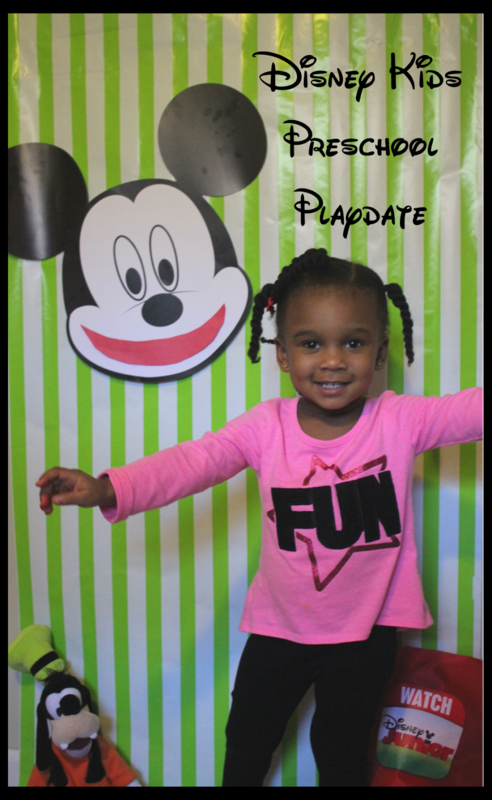 It was inspired by the hot dog song that is played during Mickey Mouse Clubhouse. I caught myself humming the tune a few times while preparing them. Special goodies always make any playdate more exciting. 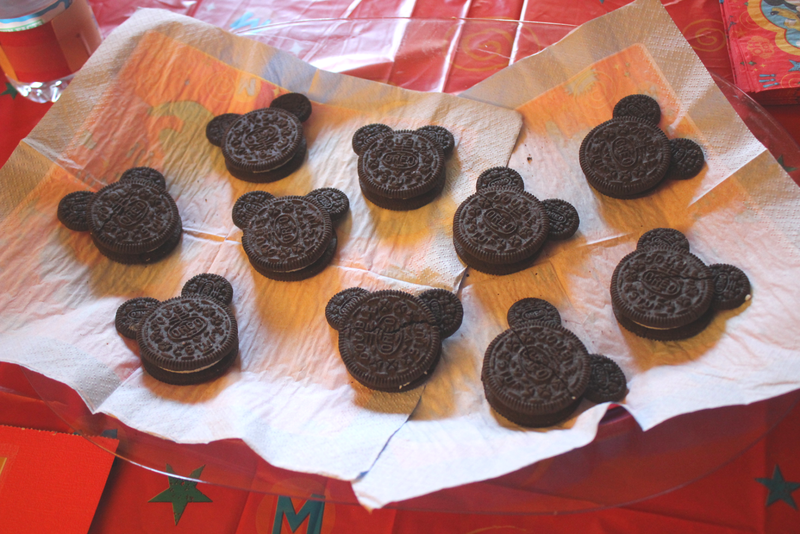 The Mickey Mouse Oreos were so simple to make. I just pressed the mini Oreos into the double stuffed Oreos to create the shape. I also filled the provided Disney "Frozen" GLAD bags with popcorn as a snack for later. There were also CARS fruit snacks available to the preschoolers. 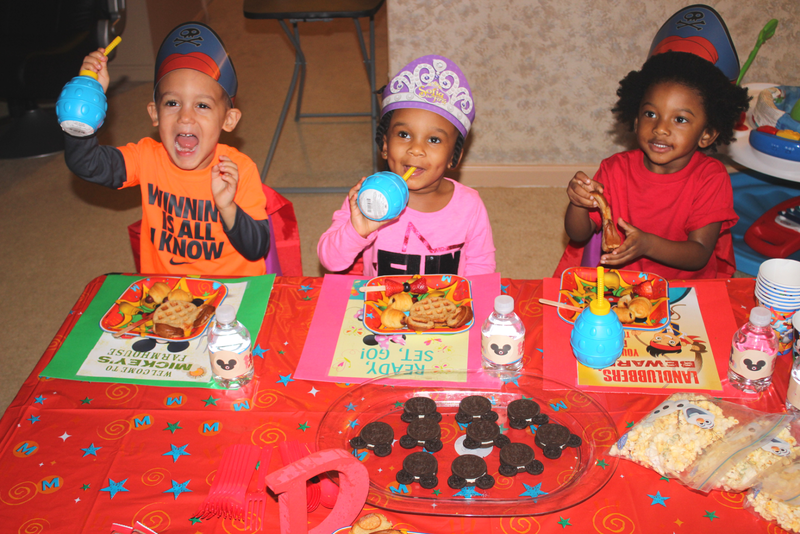 Since there were only a few playdate-goers, I was able to use some of the materials provided to embellish a few items. 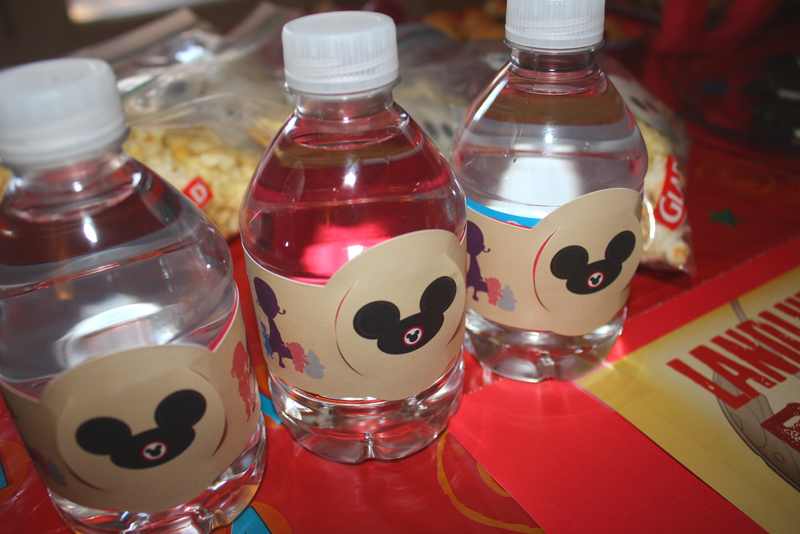 I used the ring from the Walt Disney World Resort Preschool maps to wrap around the bottles of water. This is a trick that I like to use to get the toddlers to notice and desire water more than usual. Also, if you take a look under their plates, you can see a colorful placemat. I used a square sheet of construction paper and chose different pictures out of a poster book. Then, I each picture onto a square and the children chose which character they wanted. I don't think I had any complaints. The food was enough to keep this active crew in their seats for a few minutes. It was just enough time to capture pictures of them at the table. 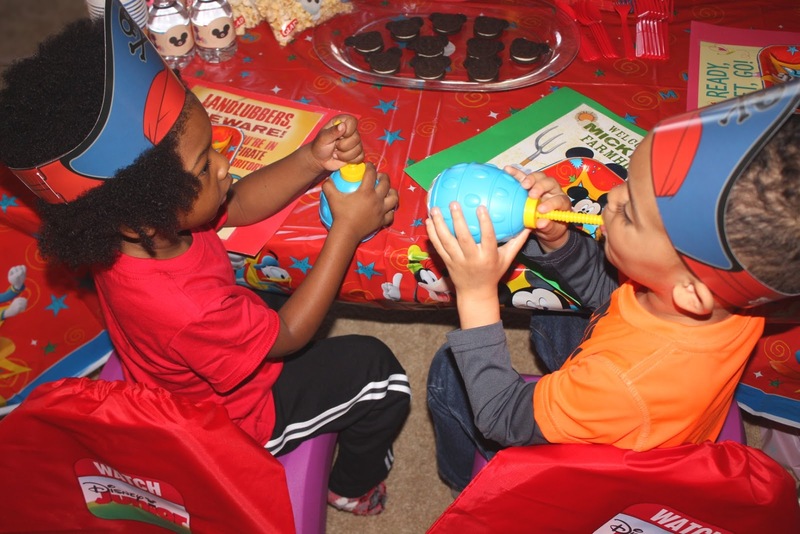 It's easy to entertain preschoolers (a cardboard box can hold their attention for quite some time). In keeping with the whole simple theme, we played one of the games supplied in the package that was sent by Disney. 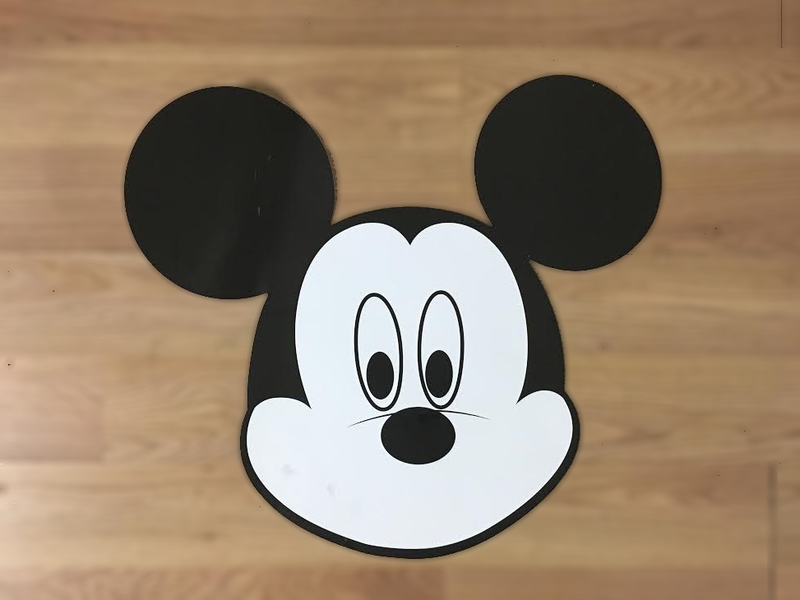 An over-sized cutout of Mickey's head with a missing smile used similar rules as the classic game of Pin the Tail on the Donkey. Instead of a tail, I cut a red smile out of construction paper to be pinned onto Mickey's face. The preschooler who came the closest to placing the smile in the correct place became the winner. They were all a little reluctant of the blindfold, but still played along. 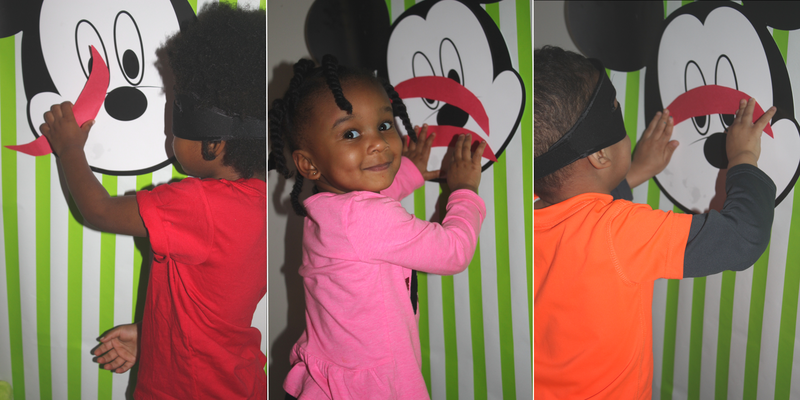 The Mickey Mouse cutout was so cute, I thought, "why not turn it into a backdrop for pictures?!" So, I did. I used wrapping paper that was lying around the house to add a pop of color. 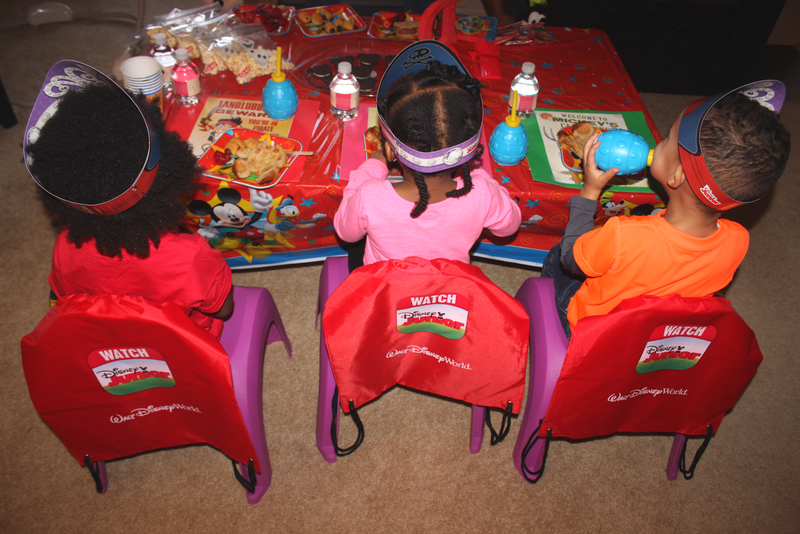 Those handy drawstring bags worked perfectly as decor for the back of the chairs at the table. At the end of the playdate, I stuffed all the items from the party (snacks mainly) into the bag to be sent home with the children. Worked like a charm. The preschoolers attempted to make puppets out of lunch bags. It didn't go so well. It may have been too close to nap time to hold their attention. They did manage to scribble a few designs onto their bags. But, that's as far as it went. 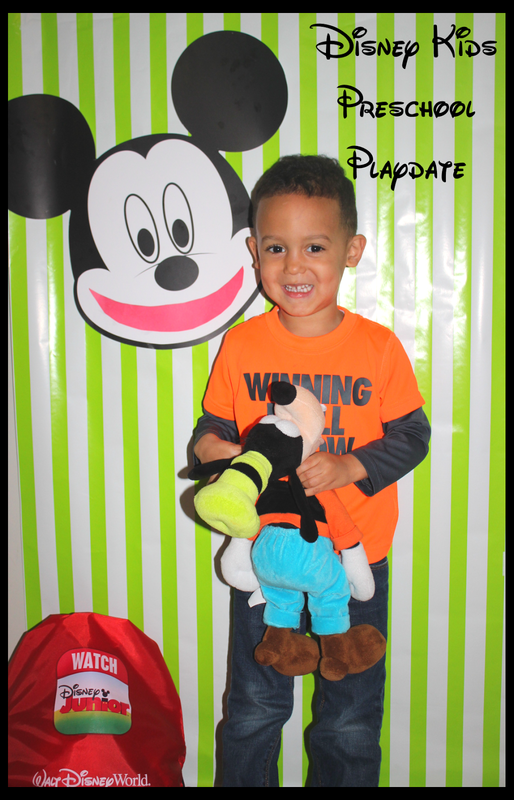 The funny part about entertaining preschoolers is the fact that you can say something as simple as, "Mickey", and they will go nuts over it. The children wanted so badly to play with bubbles. It was the perfect way to end the playdate just before they all got ready for a nap. 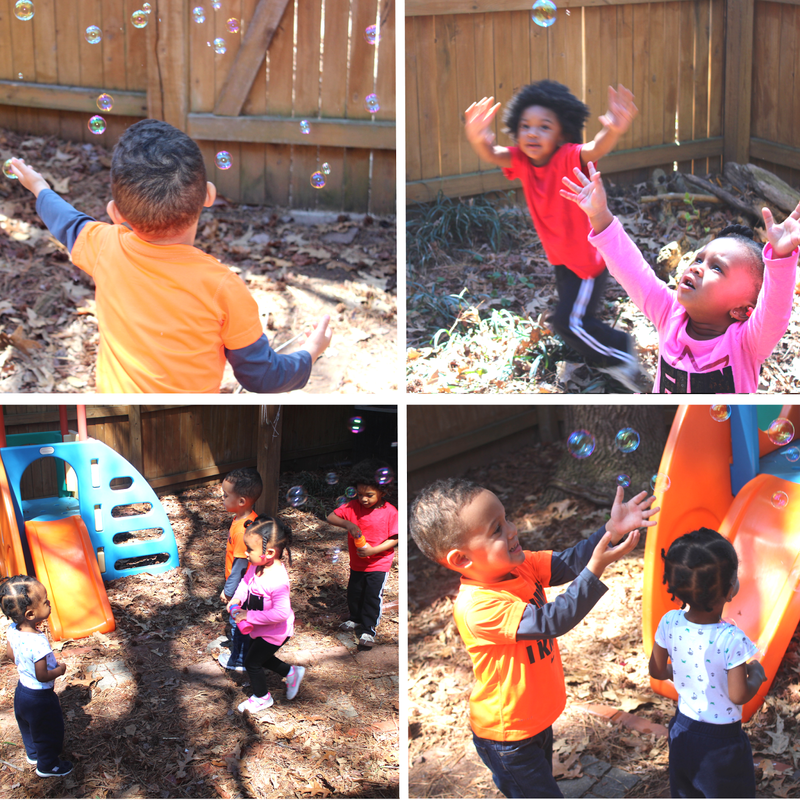 A little outdoor air on a pleasantly warm Spring day was most inviting to the tots in the backyard. 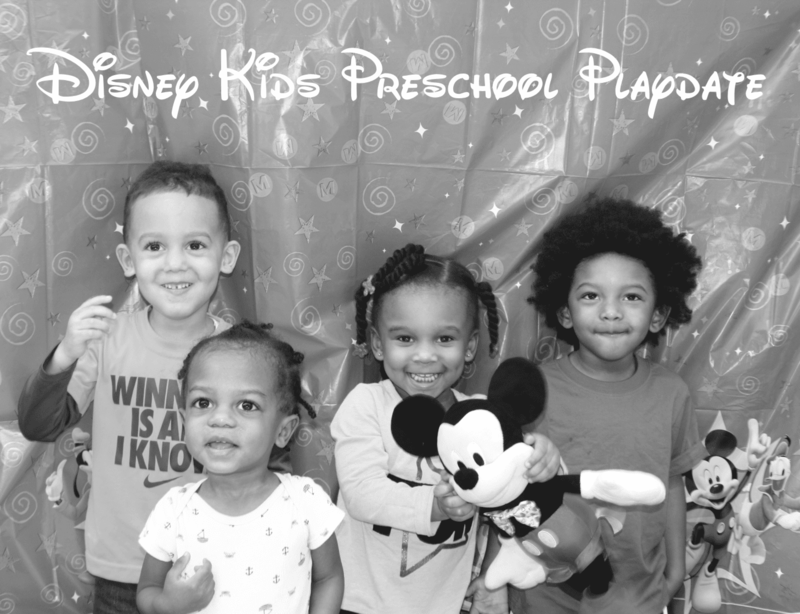 Our Disney Kids Preschool Playdate was awesome. I did not go over-the-top with games, decor and food. 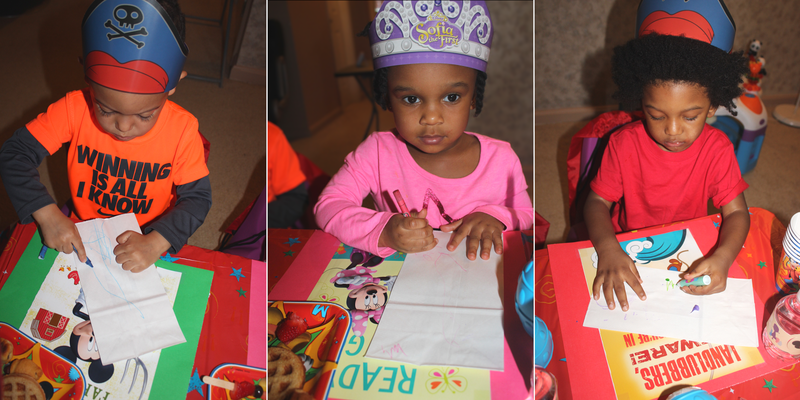 Instead, I kept it simple and made adjustments that catered to the preschoolers. It's quite similar to planning a vacation at Walt Disney World Resort – you are equipped with the proper tools to help facilitate in the planning of a memorable vacation that works best for your family. This is what makes the Disney brand so personal; there is always an opportunity to individualize your experience. And somehow, the magic always finds a way to appear, creates a ton of memories and never leaves your heart. Thank you, Disney! Let's hope I can look back on this playdate and say, "remember when we imagined that we were at Disney World? "...as we're on a plane flying to make our dreams come true in sunny Florida. Fingers crossed. Play on, preschoolers. Play on!